Age has taken its toll on my father, and he is a shadow of his former self, especially after the demise of my mom. I have been thinking of ways and means to cheer him up and get the sparkle back in his eyes. I got the answer. 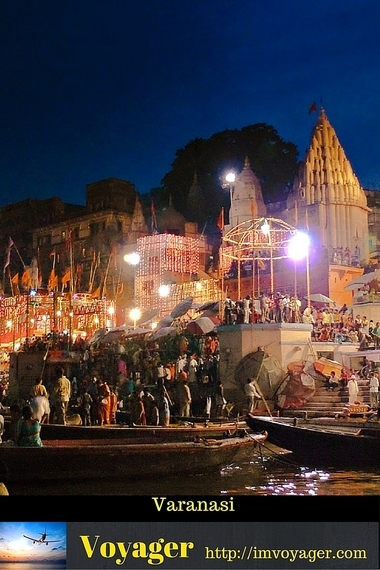 One of my father's unfulfilled dreams was to visit Varanasi, the spiritual Capital of India. He had traveled across India, but by some travesty of fate he had never been able to go to his dream city. I was sure he would love to go there and The City of Light would bring back the light to his eyes. I started making plans for the trip, the fact that I had been there helped me visualize the entire trip that I was planning for my father and I had everything planned to a t.
Varanasi can be called as the spiritual capital of India, it occupies a prime position in the list of the holiest of holy destinations for Hindus. Varanasi is also an important spiritual destination for Buddhists too as Buddha gave his first sermon and established Buddhism in the year 528 BC at a place called Sarnath, just outside Varanasi. 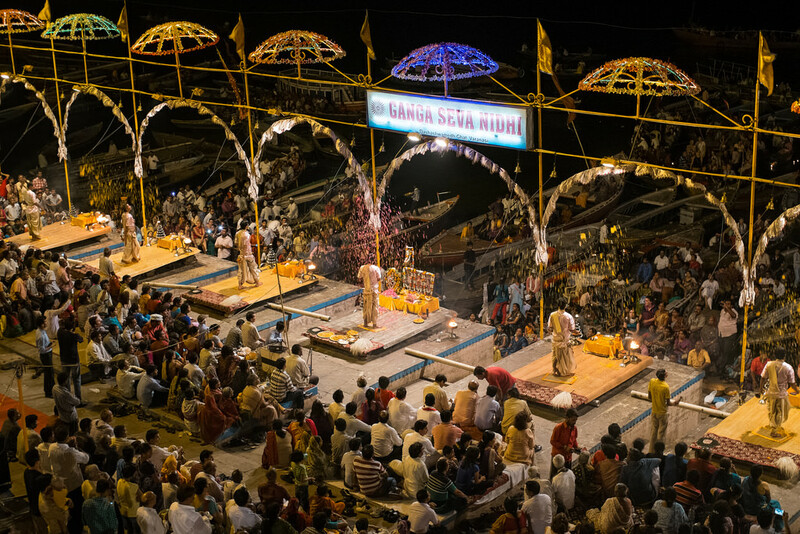 Based on archaeological evidence, it is estimated that the city of Varanasi was inhabited as early as the 20th century BC, making it one of the world's oldest continually inhabited cities. Today, Varanasi is famous, the world over for its pulsating culture, the ghats along the banks of the holy river Ganga and its 23,000 odd temples which include the Kashi Vishwanath temple dedicated to Lord Shiva with whom the city is synonymous with. Hindus believe that death in the holy city of Varanasi would lead to their salvation and this belief draws the devout like a magnet, to visit the city at least once in a lifetime. My father with a deep rooted interest and fascination for the spiritual and mythological intricacies of Hinduism was sure to love and treasure this visit to this ancient city, I thought as I gave the finishing touches to the itinerary. Varanasi is accessible by road, rail and air by all the major cities of India, including Delhi, Mumbai and Kolkata. It has an international airport called Lal Bahadur Shastri International Airport and all the major domestic airlines operate from here. I planned for us to fly in to Varanasi from Delhi, a flight of approximately 90 minutes. We would be staying at the Radisson Hotel as I felt it would be quite comfortable for my father and also the hotel is centrally located with easy access to the Ghats on the River Ganga and just about 5.5 Kilometers from the Kashi Vishwanath Temple. The Hotel also provides a free Buffet Breakfast and has a nice swimming pool. I was sure my father would feel at home here. Varanasi is a city which needs you to stay there for at least a week to really soak in the atmosphere and see all the sights. But I planned only for a couple of days as I did not want to tire out my father. I carefully selected the top things that we would see and do based on my father's preferences. This temple is considered to be one of the holiest as well as oldest of Hindu temples and is dedicated to the Hindu God Shiva. The temple's sanctum sanctorum houses one of the twelve Jyotirlingas of Shiva. Jyotirlingas are symbols of devotion and represent Lord Shiva and literally mean, "Radiant sign of Lord Shiva." This temple finds mention in ancient Hindu scriptures seems to have been existing from the beginning of time itself, however the temple has been destroyed by marauding invaders and rebuilt again and again. The last structure was destroyed by the Mughal Emperor Aurangzeb and the temple which now stands was built in its place in the year 1780 by the Maratha queen Ahilyabai Holkar of Indore. I felt a thrill go up my spine as I imagined my father bending reverently in front of the sacred Jyotirlinga and experiencing spiritual bliss. 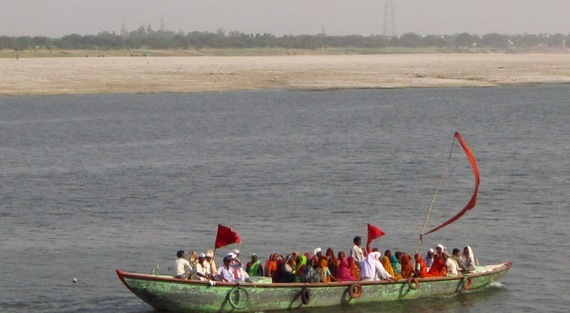 I have planned for a boat tour which would take us across the different ghats ( embankments with steps leading the the river banks) that dot the sacred river Ganga, each ghat is unique in its own right and has a glorious history attached to it. I can almost visualize my father waxing eloquent on the stories behind each of these ghats as the boat gently floated along the placid waters of the Ganga. Though he has never been there, he is sure to know everything about the city and its history as he is a walking and talking encyclopedia. He has been my Google much before search engines were invented and even today, he may come up with an answer for something for which even Google does not have an answer! There are about 87 ghats along the banks of the river Ganga in Varanasi, most of the ghats date back to 1700 AD and were built for purposes of bathing and ritualistic worship, while some are exclusively meant for cremation rites. 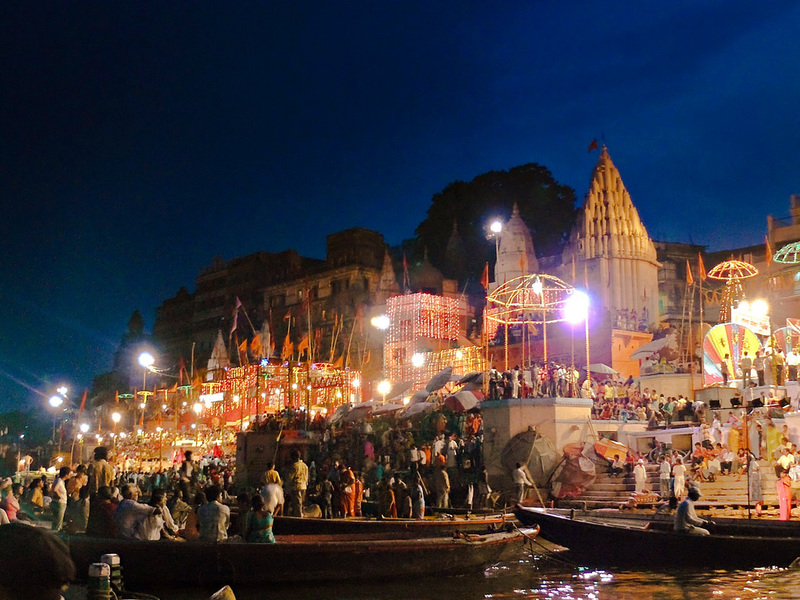 Some of the more famous Ghats include the Dashaswamedh Ghat which is very near to the Kashi Vishwanath temple and is the most spectacular of all the Ghats, the Manikarnika Ghat and the Harishchandra Ghat, both of which are ghats reserved for cremation of the dead. I am sure to hear my father philosophizing about the ephemeral nature of life when we glide past the burning funeral pyres at the Manikarnika and Harishchandra ghats. Watch this video full screen HD to get a feel of the river Ganga. 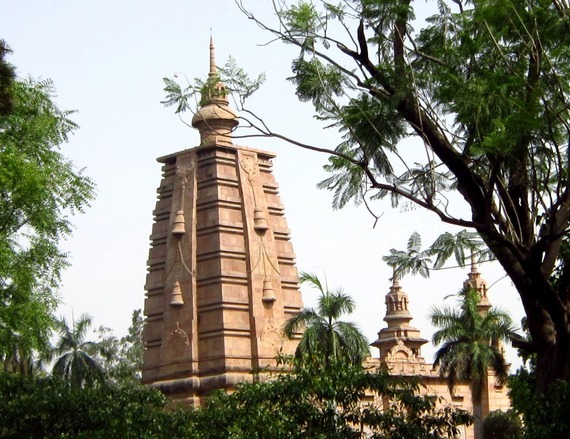 I have planned for us to take a short half day trip from Varanasi to Sarnath which is just about a half hour drive away. 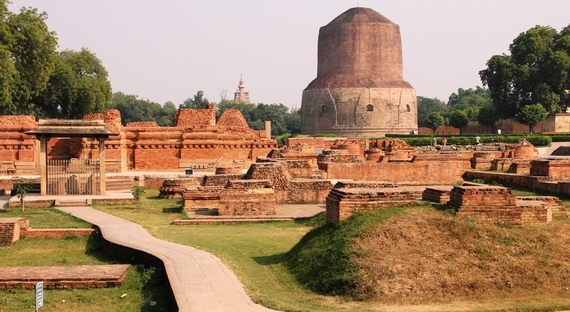 Sarnath is the place where Buddha went from Bodh Gaya soon after his enlightenment under the Bodhi tree and preached his first sermon to five disciples and laid the foundation stone for Buddhism. We shall visit the Deer Park and take a stroll in its spacious and calm environs and visit the lovely Buddha temple that stands here. I am sure my father will revel in the positively charged atmosphere of this place where many, many years ago the air was rent by the voice of the Buddha as he delivered his first sermon. Even today as you walk in the deer park if you listen carefully, the sounds of "Buddham Sharanam Gacchami," echoes in the air. We shall then visit the Archaeological Museum which is home for the various findings from the Sarnath site. The Museum has a collection of more than 6,000 sculptures and various artefacts. The most famous of these is the Lion Capital of Ashoka (sculpture of 4 asiatic lions standing, back to back), sculpted in sandstone and originally erected in Sarnath in the year 250 BCE. An adaptation of the Lion Capital of Ashoka has been adopted as the National Emblem of India. 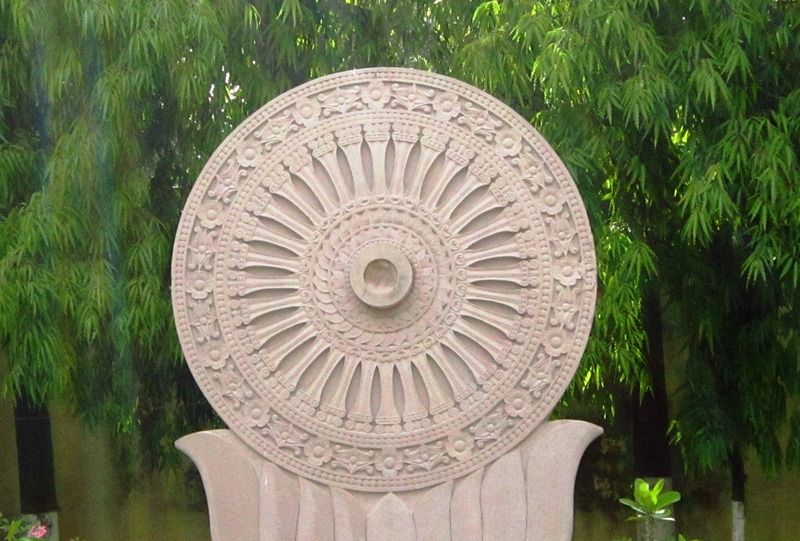 A Circular wheel at the base of the sculpture, known as Ashok Chakra, has found a place of pride in the National Flag of India. And last but not the least, we shall stare in awe at the massive Dhamek Stupa , a solid structure with a height of 43.6 meters and a diameter of 28 meters. The Stupa is said to mark the spot where the Buddha gave his first sermon. The grand finale to our trip would be, witnessing the spectacular Ganga Aarti on Dashashwamedh Ghat sitting in a boat, moored near the ghats. It will be such a blissful experience, I thought as remembered the last time I had witnessed this glittering ceremony. As the sun sets in the horizon and twilight casts its mystical glow, the river Ganga assumes a golden sheen and its gentle waves shimmer and caress the sides of the boat, the wooden boat now appearing gilded gently comes to a stop in front of the Dashaswamedh Ghat. There is a flurry of activity on the ghat as preparations are being made for the evening Aarti. Aarti is a very important component of Hindu ritualistic worship, it is the act of waving lamps in a circular motion accompanied by the chanting of Vedic mantras or hymns, facing the object of worship or veneration. The Aarti is performed in temples and houses on a daily basis or during specific festivals. In this case the worship is of the River Ganga, whom the Hindus worship as a personification of the Divine Mother, a mother who has nurtured and sustained civilization along her banks from time immemorial. Suddenly a hush falls upon the crowd as twilight slowly gives way to darkness, the ghat explodes into a brilliance of light as priests light their brass lamps and the aarti begins, the priests wave the lamps in rhythmical and circular motion in time with the mellifluous song in praise of the River Ganga that pervades the air. This ceremony lasts for 45 minutes and waves of devotion and spirituality submerge the people gathered to watch this event. The mind experiences a strange sense of calm as if the River Ganga has cleansed your very being and set at rest all the troubles and doubts that plague your mind. It is such an uplifting experience, but for me, I am sure that this time around when I witness the Ganga Aarti with my father, the magnificence of the spectacle and the spiritually charged atmosphere will pale in comparison to the smile that I will see on his face, the sparkle that will kindle his eyes again and the touch of his hand as he gently squeezes mine. I look forward to this trip and hope things go well as planned and I get to see my dad smile. What special something have you planned for your Father, do let us know through our comments section.